Born in the family of freedom fighters and revolutionaries of Indian freedom struggle, Smt. Sumedha Kailash inculcated strong values of the freedom movement. She was born in Lucknow on 10th May 1955. It is the day when India's first freedom struggle started in 1857. She also went to jail for being a part of the movement against the killing of cows at the age of 11. Her father Shri Mahatma Ved Bhikshu who was a frontrunner in the Arya Samaj movement and her mother Smt. Pandita Rakesh Rani has been an active part of Arya Samaj. She graduated from the Delhi University and gained her post-graduation from the Meerut University. 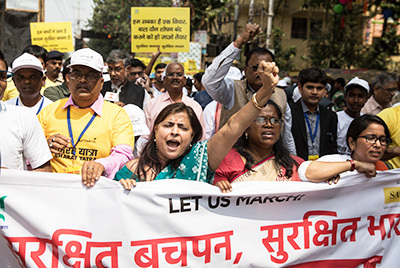 After marrying Shri Kailash Satyarthi, she as a young wife stood behind him like a pillar of strength, when he gave up his engineering career and decided to make activism his life. It was in 1980s when Shri Kailash Satyarthi founded Bachpan Bachao Andolan to build a movement against the child bonded labor & slavery. Her son is a lawyer and her daughter is a management graduate. She led and participated in many rescue operations of children, trapped as a domestic labour, the hidden form of child exploitation. She has taken initiative on many occasions to convince the parents to bring out their children from labour either on their own or through raid and rescue missions from zari factories, bangle making, brick kilns and other exploitative forms of child labour. She founded Bal Ashram (www.balashram.in) which is a long-term rehabilitation center for freed bonded and trafficked children, located in Virat Nagar, Jaipur, Rajasthan .The center was started in 1998 and till now more than 2700 children have been rehabilitated. These children were mostly bonded laborers working in brick kilns, carpet weaving, stone quarries, agriculture etc. 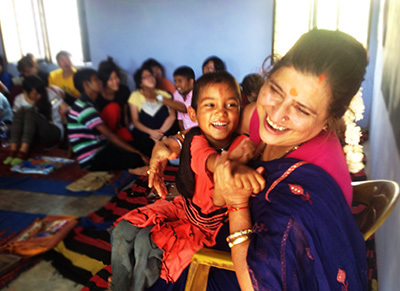 She becomes the mother figure for the children who come to Bal Ashram and connects with them naturally. She has not only been helping the children to come out of trauma but also helping them to believe in themselves and to become the change-makers. With her unconditional support, guidance and love, most of the rehabilitated youth are living dignified lives as young entrepreneurs by starting their own tailoring shop, Salon, automobile repairing shop, Electrical items repairing shop etc. and by working in the reputed firms. She has been the pillar of strength to Shri. Kailash Satyarthi in realizing his mission of creating a "child-friendly world" has its roots in the creation of hundreds of "child-friendly villages" or Bal Mitra Grams (BMGs) in India and Nepal. These exemplary villages adhere strictly to democratic principles, and children's views are accorded the utmost respect in the village decision-making process. BMG changes the very mindset and social orientation of a village, laying the foundations for the success of the children with the utmost respect for their rights. Smt. 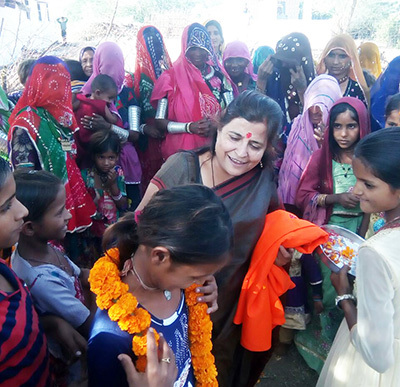 Sumedha Kailash has been instrumental in extending tremendous influence on the villages of Rajasthan through the implementation of model child friendly villages named as ‘Bal Mitra Gram' (Child Friendly Village). Her resilient leadership led to the successful transformation of 172 villages into Child Friendly Villages in Rajasthan so far. In 2009, she started Vocational Training center named as Balika Ashram where girls and women (many victims of child marriages and child labour) come for training such as tailoring, beauty parlors and computer education as well as social and cultural learning to become socially and financially independent and empowered. 1690 girls from 29 villages have completed successfully their courses since its inception. Many of them have taken up the work of training and empowering other girls and women in their villages thereby multiplying the impact. They have become the core family earners by establishing their own tailoring shops and beauty parlours, hence breaking the enduring social stigma of gender disparity in their respective villages. Her relentless fight for Girls Education in rural Rajasthan gave new direction to many girls (mostly victims of domestic labour and child marriage) who are receiving quality education in schools and universities. This is the effect of her strong will and motivation power that people have broken the long lasting gender disparities in the villages of Rajasthan and started giving importance to Education. Female school drop outs have been motivated to restart their education. Standing up for the belief in girls’ education, Smt. Sumedha Kailash proved that our voices are indeed our most powerful weapon. She believes that education sets the girls on a path to greater economic opportunities and participation in their societies. She will continue demanding progress and commitments for girls’ education in the decades to come. She also envisioned social classes for boys, girls and women in Bal Ashram where they have been imparted with the inculcation of moral values, ethics and child rights. Social education sessions transformed the children/youth into the agents for social change. As young leaders, they continue to educate youth and children in their villages on child rights, women’s right and to raise awareness on social issues such as child labour, child trafficking, child marriage, gender disparity, domestic violence, dowry system social, henceforth creating numerous agents for social change. She has taken the lead in all the awareness generation Marches of Bachpan Bachao Andolan (BBA). Starting from BBA’s first march in 1993, 2000 km Bihar-Delhi march against child labour for increasing public awareness, the first such campaign/march in India, Bharat Yatra-5000 km march from Kanya Kumari to Delhi against child labour in 1994, South Asia march against child labour and trafficking from Calcutta to Kathmandu in 1995, Global March against child labour across 103 countries covering 80,000 kms and participated by 7.2 million children, women and men demanding International ban on child labour in 1998, North East march against child labour & trafficking in 2012. The march was flagged off by the Hon’ble Chief Justice of India Mr. Altmas Kabir. Recently, she led the Bharat Yatra together with the Nobel laureate, Shri. Kailash Satyarthi, a nationwide march which was organized by Kailash Satyarthi Children’s Foundation against child trafficking and child sexual abuse from 11thSept– 16th Oct 2017 which was successfully culminated at the Rashtrapati Bhavan, New Delhi flagged off by the Honorable President of India, Shri. Ram Nath Kovind. Smt. Sumedha Kailash participated in the season finale of Amitabh Bachchan’s Kaun Banega Crorepatiwhich was aired on Sony Entertainment Television on 6th October, 2017. She participated along with the Nobel Laureate Shri Kailash Satyarthi. They spoke about fighting the evil that is child trafficking, child labour, and the sexual exploitation of children. The Nobel Laureate raised the issue of missing children and spoke about how the statistics of ‘every child who goes missing every six minutes’ was skewed, since these numbers are restricted to only registered cases. The real figure of missing children is far greater as most cases, and low profile victims are not even registered. The missing kids are often used as slaves, made to do inhumane tasks in the name of labour, circulated in the illegal organ trade and child brides. He didn’t shy away from mentioning that everything, from the skin to their internal organs are profited by. A video of Bal Ashram was also presented in the episode in which the children shared their experiences in Ashram and their ambitions in life. Kinsu Kumar who is now pursuing Mechanical Engineering joined Smt. Sumedha Kailash in KBC as companion and shared his experiences with the audience. Through her efforts, the first generation of Banjara community could think of attending school, she has been engaging Banjara children in order to ensure the better quality of education system by running Banjara schools, health care system and sports. This is not limited to education but rehabilitation of entire community. Traditionally a nomadic community, the Banjara community in Virat Nagar has seen a historic transition in their social and cultural system since 2008 when Bal Ashram started working for the education of Banjara children. Starting with the first school in 2008 in Bangdoli village, today Bal Ashram runs 7 Banjara schools in Nimdi, Bhangdoli, Gopalpura, Narayanpura, Raipura, Bairawas and Guwada Hanuman, engaging 150 children in regular education. 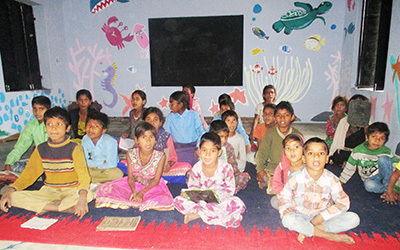 After receiving non-formal education in Bal Ashram Banjara school, 30 children so far have been enrolled in government schools for formal education. Smt. Sumedha Kailash, with her dynamic actions and spirit has been a powerful force in mobilizing the community. The villagers adopted a unique way to show their commitment to end child labour by organizing a 'Yagna' to eliminate child labour. The first Yagna' was performed in village Sothana and was soon followed by other villages of Virat Nagar block. She has been keenly involved in the capacity building approach of the women in the community at the local level. The community involved such as Alwar, Jaipur, and Ajmer district of Rajasthan on the issue of child labour and child marriages. The changes brought by Smt Sumedha Kailash in the lives of Bal Ashram Children, she was honored by Ramkrishna Jaidayal Harmony Award in 2000. She was awarded with Godfrey Philip Bravery Award in the act of valor, social service and humanitarian deed. Smt Sumedha Kailash had been felicitated women power with the sixth edition of Aadhi Aabadi Women Achiever's Award in 2014.The award had been instituted to accolade exceptional service of current significance rendered by woman of the country.